Greg Boswell on the first pitch of Pic'n Mix (IX,9), Coire an Lochain, Northern Corries. (Photo Guy Robertson). 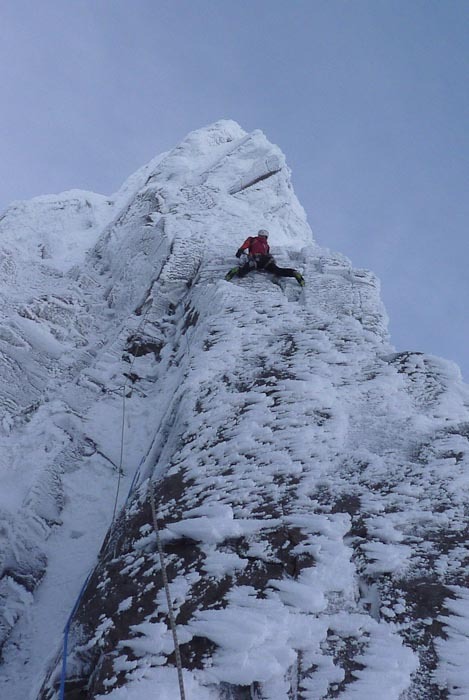 On Monday March 29, Guy Robertson and Greg Boswell made the second ascent of Pic’n Mix in the Northern Corries. This fierce (IX,9) was first climbed by Ian Parnell and Tim Emmett in April 2006. The route starts up Never Mind, a steep 60m-high HVS rock climb on the pillar between No.3 and No.4 Buttress in Coire an Lochain. The second pitch follows the E3 groove of Mindless before breaking back right then left to an independent finish. Prior to its first ascent it saw a number of determined winter attempts and was regarded as one of the last great problems in the Northern Corries. Afterwards Emmett compared it in difficulty to Happy Tyroleans (IX,9). So yet another fabled test-piece is repeated this winter – what a season! This entry was posted in Repeats and tagged Greg Boswell, Guy Robertson, Northern Corries. Bookmark the permalink.